STRUCTURE: GSBK Biuro Konstrukcyjne s.c.
Raised in 2007, the building fills the gap in the tissue of Kraków’s city centre that emerged after the demolition of the building Pod Lipką in 1939. Standing on the corner of Grodzka Street and Wszystkich Świętych (All Saints’) Square, it is a location of extremely high visibility, situated by the Royal Route between the Main Market Square and Wawel Castle, in the heart of the 13th-century urban plan, surrounded with historical architecture dating back as far as Gothic. Hovering between the square and the Hill is the spirit of Stanisław Wyspiański, whose stained-glass decorations and polychrome murals adorn the nearby Franciscan and St Mary’s churches. Definition of the functional and formal composition of the building, proper for this historical space, and definition of an appropriate level of reference to the historical surrounding walls were the main task behind the design. The two main functions of the building, namely, to provide information and to display the stained-glass windows, required distinctive interior spaces. While the stained-glass windows need displaying in a high, serene, and dark interior, the public part providing information should be open and bright by nature, visible from outside, and providing visibility of All Saints Square and the the Wielkopolski Mansion (today: Municipality of Kraków) from its interior. The designers found a solution that combines these contradictory guidelines so that the external wall is both transparent and opaque. Moreover, the material used establishes a dialogue with the neighbouring buildings, predominantly with the brick Gothic churches of the Franciscan and Dominican orders. 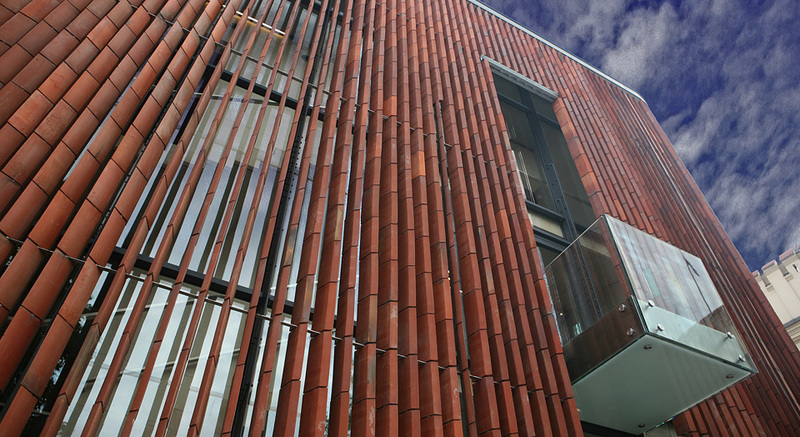 Used for the external wall, bricks of special form, trapezoidal in cross-section, were arranged vertically. Such a deployment provided a distinctive external movable curtain: an external system of shutters. This new form of a ceramic curtain, adjusted to the functional and lighting needs of interior is highly contemporary in its expression, yet remains consistent with the history of the place. It is another attempt by the IEA Studio to create contemporary architecture resulting from our study of the surrounding space, and the understanding of relationships between the traditional and contemporary language of architecture.